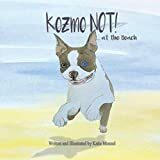 Do you ever get so excited that you just want to jump and run everywhere and want to lick... well maybe not lick everyone - but KOZMO does!Join him in his first book adventure with his little humans to the beach - He would love to play with you!Then be sure to join him on his other adventures coming soon! South Carolina native Katie Monzel is a self-taught artist that merges her lifelong love of people, nature, and animals with a newerfound love of children's book writing and illustration. She lives in the Carolina lowcountry and has used her local setting and her boisterous pup to inspire her first children's book. A beach adventure is the perfect start for her upcoming "Kozmo NOT!" series.